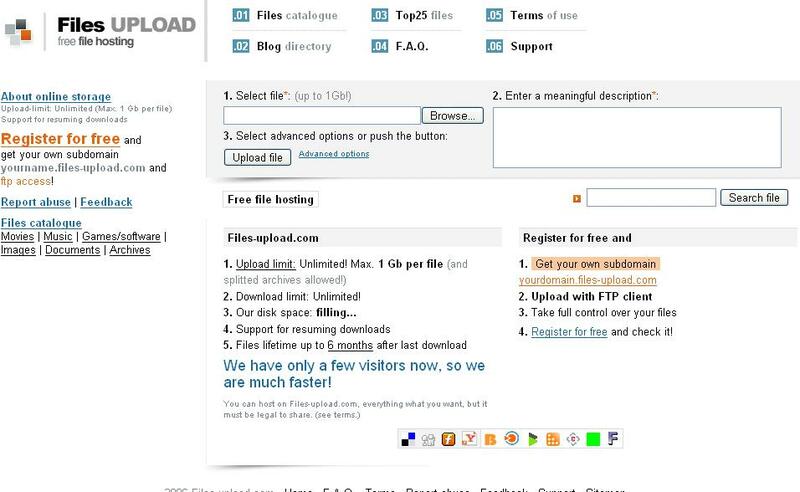 Files Upload isn't a traditional file hosting site. Yes, it allows unlimited uploads 1GB at a time, but it's also got a bit of a file sharing flavor as well. First off, the UI is nice with a few simple ways to customize privacy options for your files (password-protected, hide in catalogue). If you register, you can upload via FTP and get a custom subdomain (yourdomain.files-upload.com). On the downside, files that haven't been downloaded for the last 6 months will be deleted. An interesting feature is the ability to search through files that have been uploaded to the site, which is where the privacy options come in if you need them. Files are cataloged as movies, music, games/software, images, documents, and archives, which makes Files Upload look a bit like a file sharing site. There's also a top 25 files page if you want to see what files are hot and possibly download them.